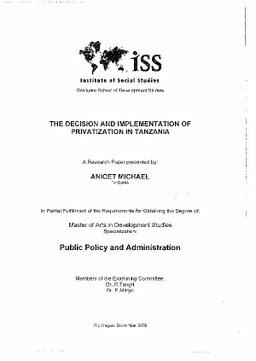 The growth of Tanzania's public enterprises I can be back as far as 1967 when Arusha Declaration sought to put the major means of production in the hands of the govemment. Various statutes that sought to nationalize companies that were privately owned effected this. The Public Corporations Act of 1969 was passed that gave the president powers to establish state owned enterprises by a simple order published in the government gazette. From 1950s to early 1970s, state interventionism in the economy was the dominant paradigm, where govenm1ent directed allocation of resources for production, took an active form in production and provision in the public sector. Various forms of price control were administered, where in Tanzania, The National Price Commission was setup in 1974 to regulate prices.